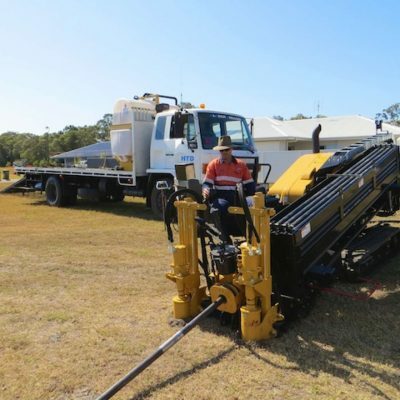 HTD Australia is a Brisbane, Queensland based company specialising in horizontal directional drilling / underground boring services for the installation of conduits under paths, driveways, roads, rail, congested and environmentally sensitive areas. Despite the size or location of your project, at HTD Australia we offer underground, trenching, and directional boring construction projects. Whether it’s a small project, like getting under a driveway, or one on a larger scale we have the right tools and resources to make this possible. These are just some of the many services that we offer at HTD Australia. As one of the leading underground boring companies on the Sunshine Coast, we take pride in our strong team, innovative technology, and cost-effective services. A large part of what makes us such reputable underground boring contractors is our team. Our team of specialists offers top quality boring/drilling services. They efficiently install conduits underneath any surface whether it be rail, roads, driveways, paths, creeks, congested or environmentally sensitive areas. In addition, we have several years of experience in this field and are equipped with the best tools and resources to offer quality underground boring services on the Sunshine Coast. Offering nothing less than quality work, we deliver exceptional boring into the ground and drilling services. At your side every step of the way, you will be the first to know when updates occur. Looking for Professional Underground Boring Experts? If you are looking for trustworthy and experienced boring experts look no further. HTD Australia has what you need, and our specialists are ready to get started on your project. We make the process of getting your job started very simple and effective. Begin by reaching out to us. One of our experts will talk to you about your options and give you an estimation of how much your project will cost without any kind of obligation. Covering a wide spectrum of services, we are confident to be a leading provider of boring services within the Sunshine Coast area. Our project planners will work with you to review and design a plan that you’re happy with. Keeping you updated every step of the way, we guarantee you won’t find any other service like ours. In the industry for over 30 years, we know the ins and outs of drilling into the ground without disturbing the surface. At HTD Australia, we have been servicing small to large businesses, local councils and homeowners. We are proud to be a leading provider of underground services throughout Australia. Based on the Sunshine Coast, we use cutting-edge technology along with efficient tools to meet client expectations every time. We are confident that you’ll enjoy doing business with us. No matter the size or location of your project, contact us for a complimentary quote and one of our agents will get in touch with you in a timely manner. For more information about how we can help, call us today! Proudly Serving The Sunshine Coast!